The dramatic and damaging collapse of the New Zealand finance company sector over the last three or four years has attracted a good deal of attention, largely because of the multi-billion losses that investors have suffered. One of the consequences has been a boost to the confidence felt in banks which have reinforced their reputation as the best place to put one’s money. It is certainly true that, while overseas banks are up to their necks in scandal, our largely Australian-owned banks have maintained an enviable stability and reliability. But the tribulations of banks worldwide make it inevitable that the role of banks in the global economy should increasingly come under the spotlight. The revelations that many of the world’s leading banks have been guilty of dishonestly rigging markets and misleading investors have already claimed one victim, in Barclay’s Bank, and seem certain to involve many more. And that comes on top of the role – dubious at best, irresponsible and dishonest at worst – that the banks played in bringing about the global financial crisis in 2008. Not surprisingly, the British government is establishing a full-scale review of the banking sector, and few would now bet against the pressing of criminal charges. But it could be argued that these scandals are not just a reflection of the criminality of a handful of bank leaders but arise inevitably from the role that banks in general have been allowed to play. Most people still see banks as institutions that provide a safe repository for our savings and that from time to time lend us money either on overdraft or on mortgage. But this is seriously to underestimate the power that banks wield in our economy and the extraordinary nature of the concessions that allow them to do so. The central feature of banks, which seems only dimly understood even within the banking sector itself, is that they are private commercial enterprises which have been granted a unique and virtual monopoly over the creation of money. By far the largest proportion of the money in our economy (and in the economies of all advanced countries) is not notes and coins but bank-created credit. That credit represents no more than bank entries by bank officials; its status as money rests entirely on the suspension of disbelief – or, to put it another way, on our willingness to accept that it is money because the banks say it is money. The failure to understand this fundamental aspect of our economy leads to serious errors in formulating economic policy. The overwhelming role of credit-creation by the banks in inflating the money supply should be our central concern in controlling inflation, particularly when the vast majority of that credit is created and lent for non-productive purposes like house purchase. Because we don’t understand this inflation-engendering phenomenon, we grapple with inflation using seriously inadequate and inappropriate instruments like interest rates, which are not only slow-acting and poorly focused but do great damage to the rest of the economy. A more accurate analysis of inflation-producing pressures in our economy would lead to more effective measures to restrain them and at the same time encourage a more productive and competitive economy. We can see how privileged and unaccountable banks are from the fact that their unique capacity to create and lend vast quantities of “money” for private profit passes under the radar, whereas a democratically accountable government that occasionally “prints money” in the public interest draws screams of blue murder. But it is not only this aspect of the banks’ operations that should cause concern. Over the last two or three decades, the banks have used their ability to create money to invent a whole range of new financial instruments of dubious value which they are then able to sell to gullible investors; so profitable was this trade that it became much more important to banks than their traditional role. It was this prospect of unlimited profits created out of nothing (to say nothing of the huge rewards and bonuses paid to individual bankers) that led in due course to the global financial crisis. And when that irresponsibility inevitably ended in collapse, it was that same mentality that led bankers into the realms of fraud and criminality. In a world where anything goes, the rules are made to be broken, and personal fortunes are there for the taking, who can wonder that bankers could not accept that the ordinary rules applied to them? We have reaped what we have sown. In case we should assume that none of these problems afflict us, let us not forget that our own banks, pillars of propriety as they may seem by comparison with their overseas counterparts, have made strenuous attempts to avoid their tax liabilities and have only been made to pay up by court action. And in our case, the banks have not only made huge profits by exploiting their unique capacity to create money, but have then exported those billions across the Tasman, thereby placing a huge burden on our already beleaguered balance of payments. Isn’t it time to establish a banking system that supports the economy rather than places it at risk? The recession may not yet have reached its mid-way point, but already the lessons that seemed so stark in the immediate aftermath of the financial meltdown are receding fast. The way out of recession is apparently being directed by traffic lights and signposts controlled by worryingly familiar faces. Foremost amongst these phoenix-like revivals are the banks. Just months after they were rightly seen as basket cases – their irresponsibility and greed the primary causes of the recession and their very survival requiring billions of pounds of handouts from the hard-pressed taxpayer – they are back in the box seat, not only apparently immune from reform or regulation, but again paying out huge bonuses, and their unchanged role accepted as essential to economic recovery. According to their own pronouncements, the least surprised at any of this are the banks themselves. Are their affairs not directed by the most brilliant operators who can only be attracted by huge salaries, bonuses, fees and commissions? Is our economic future not totally dependent on their freedom to make as much money as they can for themselves and their shareholders? Is the recession not itself proof that the banking function is not only too important to be allowed to fail but is in the end best left to those who know what they are doing? Some of these claims can be summarily dismissed as laughable examples of special pleading. A plumber or bus driver who proved himself so incompetent at what he was employed to do that he flooded the house or crashed the bus could not claim that he was uniquely qualified for a supremely demanding occupation, but would be out of a job. Bankers who destroy the financial system should be similarly judged. And our supposed dependence on the City’s earnings is – far from being a reason for re-instating the status quo ante – a striking warning against allowing this dangerous situation to arise again. Among the many lessons we should not forget is that City earnings not only go to a tiny fraction of society but require support from an economic policy which – by giving priority to those who manipulate existing wealth over those who invest in and create new wealth – is guaranteed to destroy other kinds of economic activity, particularly in the real, as opposed to financial, economy. Those who have lost jobs in manufacturing, for example, have literally paid for the bonuses “earned” by City fat cats. 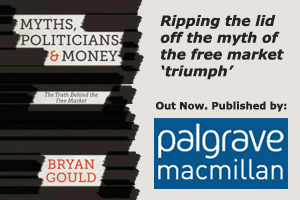 Perhaps the most surprising of the claims made is that the banking function is of central importance to the whole economy but should at the same time remain in the hands of a private oligopoly – and an oligopoly that is entitled to put its own interests ahead of the general interest. Even more surprisingly, after all that we have recently experienced, this argument seems to have been accepted without demur by the government that spent our billions on rescuing the banks. It has always been a mystery that the banking function – which in macro-economic terms means essentially the creation of credit and therefore of money – should have been allowed to develop in private hands. The banks have avoided scrutiny on this issue, first by (improbably) denying that they create money, secondly by arguing that the function is in any case so important to the economy that it would be too dangerous to disturb it and finally by maintaining that only they have the expertise to discharge the function anyway – and all this at a time when the prevailing orthodoxy is that the most important factor in economic management is the rate of growth in the money supply, so that the banks’ central role in the creation of credit – the most important single factor in the excessive growth in the money supply – has an additional and unmistakeable macro-economic impact. What the recession has demonstrated is that none of these defences can stand. The first stage of the financial crisis was largely one of liquidity and arose because the banks’ (supposedly non-existent) ability to create credit was brought to a halt. This required government intervention on a massive scale – so much for the argument that the bankers’ role should not be disturbed – and this in turn showed that it was not the bankers’ expertise (which was manifestly in very short supply) but government resources that underpinned the banking function. So, if the public has an intense interest in the proper discharge of the banking function, and the last-resort guarantor is the public purse from which billions of our money have been spent, why are we content to allow the private oligopoly to proceed on its merry way and to decide in their own interests issues that matter to all of us and that should be placed under democratic control? Why would we not consider some form of public ownership (we have, after all, paid many times over for banks that were virtually worthless) or, at the very least, a degree of effective regulation to ensure that the public interest was protected and that the banking function served that interest rather than private greed? The prize is, after all, a banking system that serves the wider economy and not just itself. Our failure (or refusal) to see this shows just how deeply ingrained is our frame of reference, and how much at risk we remain from a repetition of past errors.